St Colmans College J2 team retain their Ulster Champion status for another year, having being unbeaten in Ulster for 2 years running! This year's St. Colman's College J2 Basketball team went undefeated in the Ulster Championship beating all other teams in the group with their toughest match against Ballymena Academy in the preliminary rounds. For the first time in two years the team found themselves down by double figures at half time but in true St. Colman's spirit rallied themselves to eventually come back and win the game by double figures. A similar scenario occurred in the Ulster Final when again they found themselves playing against their rivals, Ballymena Academy, leading to the same scenario of trailing at half time. Knowing they had beaten Academy on two occasions over the 2 years, the St Colman's boys once again reached deep to pull themselves back, playing exceptionally well ti turn around the deficit and emerge Ulster Champions with a final score of 31-21. The team also qualified for the All Ireland shield Quarter finals in Galway- a great achievement. Excellent performances throughout the season by the entire squad, in particular, Captain Paul Og McCormack, Oisin O'Hare, Ronan Cinnamond, Josh McAteer and Newry Fliers player Adam Hanna. 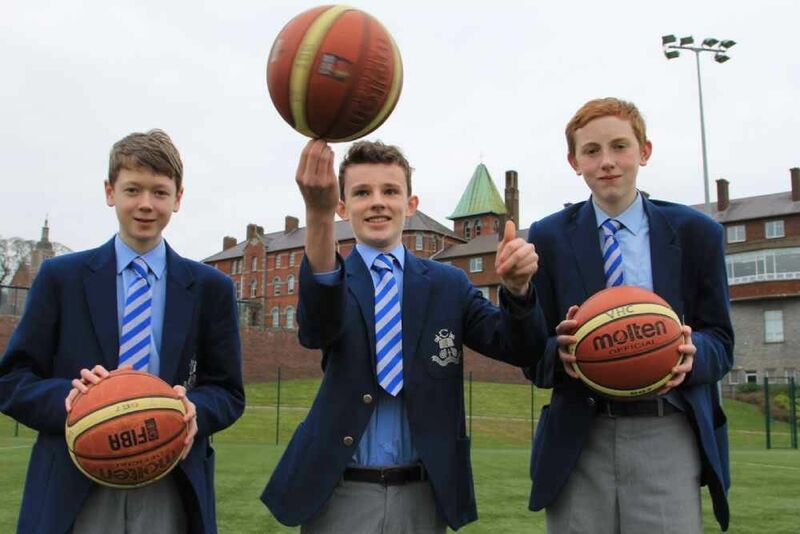 Hat trick for J3 St Colman's basketballers. St Colman's College J3 team retain their Ulster Champion status for another year, having being unbeaten in Ulster for 3 years running! After their success against strong teams such as St Ronan's College Lurgan, Abbey CBS and St Joseph's College Derry the VHC boys continued their undefeated path to the final where they encountered a tall and physical St Patrick's Ballymena side. Being out matched in height did not faze the St Colman's boys as they fought for every rebound and worked hard about the paint. Great team work sealed the J3 shield once again with a final score of 38:21 (Shane Morgan: 17, Conor Mathers: 10, James Poucher: 10, Se O Grady: 1). The team went on to qualify for the All Ireland quarter finals both in the cup and the shield. A greater year for the J3 team! Following 2 years of success with St Colman's College a few VHC basketballers took up the reins of club training, taking the club scene and in some cases BNI by storm. J3 captain, Conor Mathers lead the way. Having played with Newry Fliers for many years Conor was ed for the Basketball Northern Ireland U16 team to gain his first 2 caps for NI, playing Wales. Within only minutes of playing Mathers managed to light up the score board, helping the team to victory, as we all knew he would. A great year for Conor, captaining his VHC team to victory for the 3rd year, picking up another MVP in the school's shield, being award Most Valued Player for Newry Fliers U16 team and making the cut for the Basketball Northern Ireland team. We are all very proud of our captain as he continues to perform brilliant on and off the court. J3 Vice captain, Shane Morgan, had a fantastic year. After only 1 year of playing at club level, Shane was awarded Basketball Northern Ireland MVP following his success with Newry Fliers as they won both the U14 BNI development league and Cup. Shane went on to play a pivotal role in St Colman's College being crowned Ulster Champions for the third year in a row. However, his success did not stop there, as Shane was also ed for the Basketball Northern Ireland team, picking up caps against Denmark and Scotland. Following the steps of the J3 captain, the J3 vice-captain was also awarded MVP for Newry Fliers U14 team. Well done Shane!! Captain and vice-captain are leading the way as always with James McKinless having a good first year playing for Phoenix and Se O' Grady, Conor Brolly, Niall Brolly and Adam Hanna for Newry Fliers.